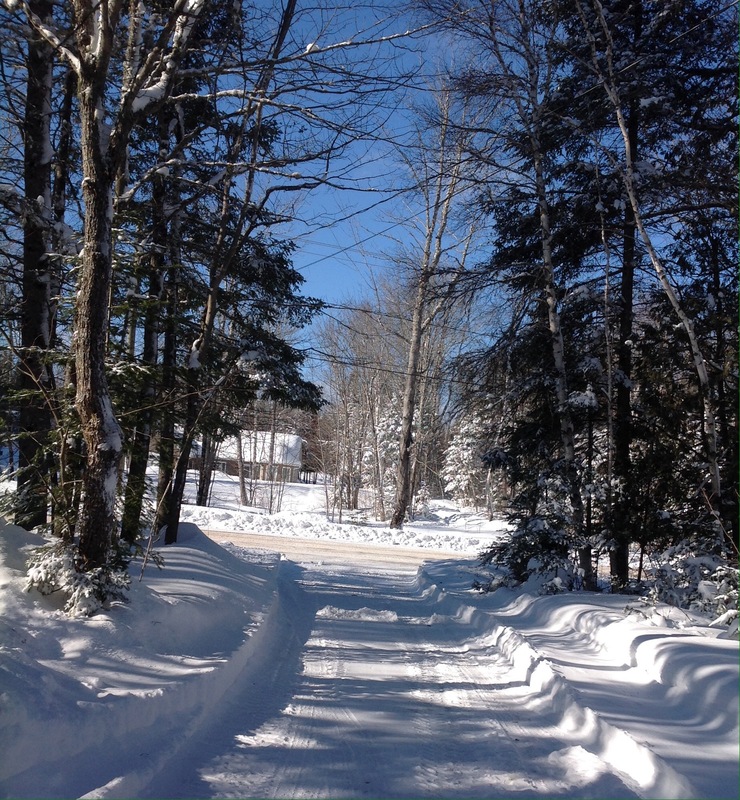 In southern New Brunswick, we are recovering from a snow and ice storm. My husband has been in the tractor, removing snow and ice, for two days. Between runs with lunch and diesel, I am reading Ann Cleeves, one of my favourite UK detective authors. The phone rings and I am wrenched from a very different kind of storm in the Shetlands to a neighbour who wants the services of an ice-gobbling tractor. As the sun goes down, I re-live the beauty of the day. Chickadees, a downy woodpecker and a red squirrel spent the afternoon competing for the sunflower seeds in our feeder. Every tree is laden with ice and the wind stirs up powdery snow-devils across open places. The evening begins with memories of glassy trees and the faint tinkling of their twigs and branches. To join in the dance. Our first big snow arrived Saturday night. Twenty centimeters of fluff. Time to begin snow removal duties. 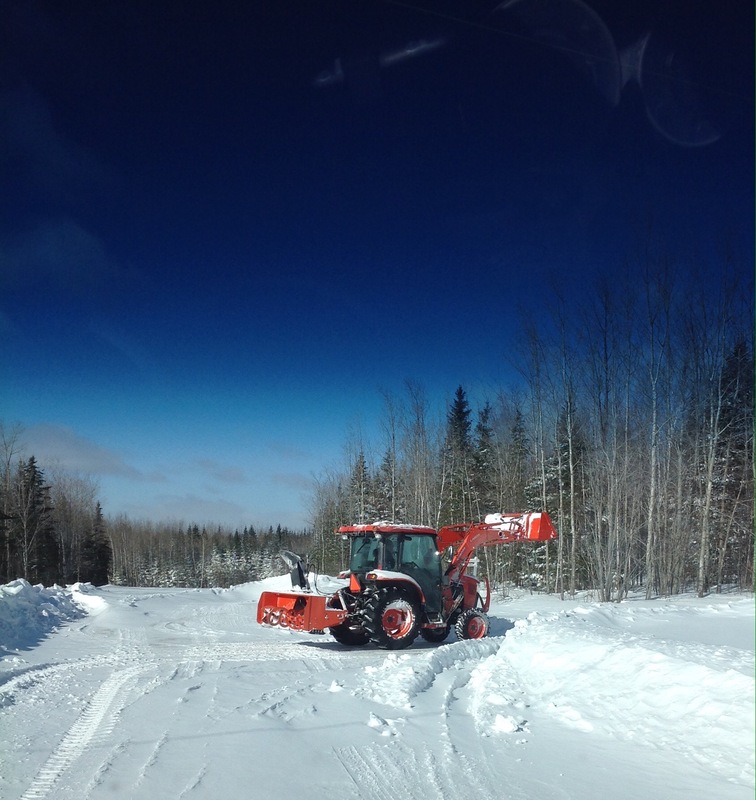 This year my husband has about 30 clients for snow removal and he has been getting ready for a couple of weeks — staking driveways, buying diesel, replacing lights in the tractor array, removing stressed bolts and moving things around the yard to make moving the snow as simple as possible. My duties are simple and few. I set the alarm for 3 AM, print off the client list from the computer and run the checklist — water, raisins, earplugs, client list, flashlight, cell phone, “go bag”. The “go-bag” has about sixty pounds of chain, a roll of tow strapping, assorted connection devices and anything you would ever want to pull yourself from a ditch. I also supply diesel when needed and lunch. No set times for anything. Just a hearty meal, packed to eat on the road, when my husband gets hungry. Otherwise, I answer the phone, work away at various editing projects and worry. Things can go wrong out there in snow-land and they often do. A stray two-by-four goes through the blower. The tractor slips off the side of a driveway into a deep ditch. The plow for the main roads is late. There are three cars in the driveway and no one at home to move them! My husband is the only one I know who talks about snow and winter longingly in the middle of summer. Everyone should love their work as much as he does! Enjoy your snow-day where-ever you are. We have had lots of snow in central New Brunswick. 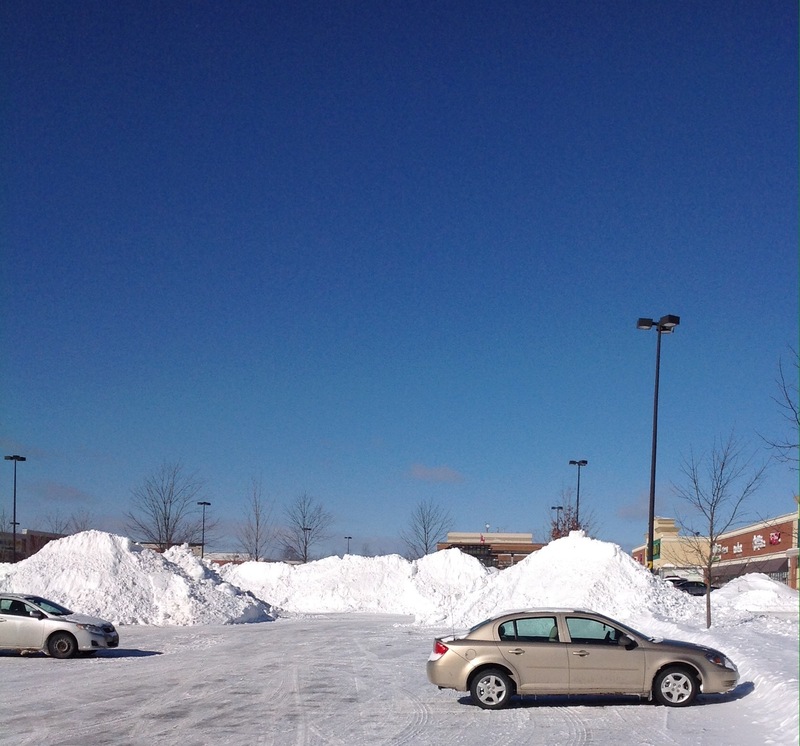 So, just a few photos to show you my day on Friday and all the piles of snow!